ETF Global: Student ETF Investment Contest - Registration Open! Student ETF Investment Contest - Registration Open! Exchange-Traded-Funds remain one of the fastest growing instruments for current investors and an investment of choice for emerging investors. To further the investment education of collegians, we have launched the ETF Global Portfolio Challenge which provides college students the opportunity to select a virtual portfolio of ETFs and compete on its performance. The contest is FREE and requires no purchase at any time. Through our collaboration with Stockfuse, students can compete against their fellow classmates and other schools for some very cool prizes intended to benefit both their educations and their careers. Students can register at www.etfportfoliochallenge.com through September 18 - so sign up today! 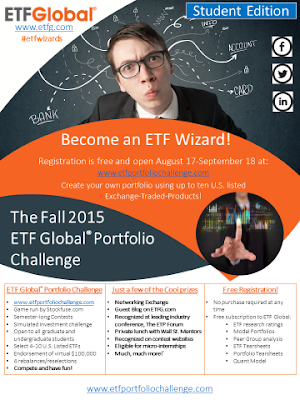 Here is the contest flyer: Flyer - ETF Global Portfolio Challenge - Fall 2015. Please forward to any college students who may have interest.